When I try to use the zyxel drive app I get a fail message in it that looks like this in the picture. I haven't ever got in and could use the app because of this message. Why is that? Please help me quickly. App works fine with Android 7. But when switching to a new Mobile with Android 8/9 same like above: Logging in to my nas - showing folders (like photo, music a.s.o.) 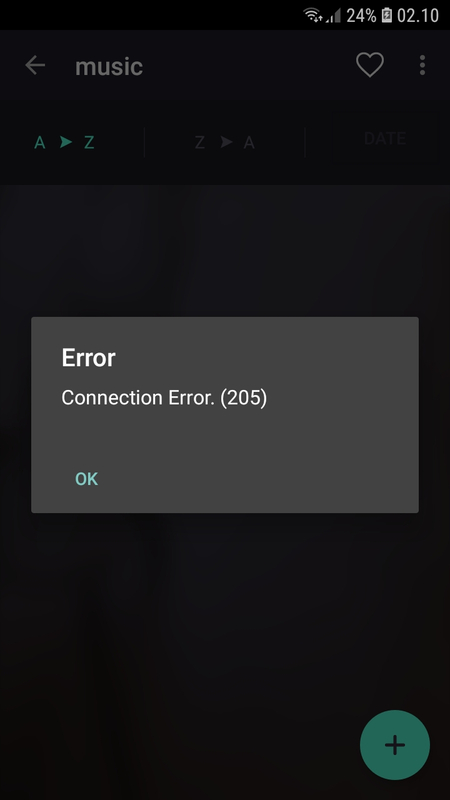 - when trying to open: connection error (114). Seems depending on this Android version. Test with old phone: still working. But accu power of this old phone is not working well, so I replaced it. Maybe one of the developers of this app will read this and will work on a new version of this app. As I read you face a problem of Error 205. This is due to your upgrade your version to Android7 to Android 8. Don't worry you overcome via this problem via update your Zyxel application. The second process you need to do is to convert your application to system application. After that, your Application works fine with your phone.